Ravi Shastri took over the position of Head Coach of the Indian Team from Anil Kumble, whose successful one-year tenure ended on a bitter note after a fallout with Kohli. “I have matured since I last went to Sri Lanka and I have matured immensely in the last two weeks. Mine will be a refresh button that will be pushed. I carry on from where I left. I don’t come with any baggage. The team has done exceedingly well over three years and they are the people who deserve the cricket more than anybody else,” Shastri said while responding to the two-year contract that will be in place till the 2019 World Cup. The Ganguly-Shastri spat has started from the appointment of outgoing coach Anil Kumble in 2016. Shastri, whose term as team director had concluded after the World T20, was favourite to take up the head coach role. But the CAC comprising Sachin Tendulkar, Ganguly and VVS Laxman recommended Kumble to take charge. Shastri had reacted, blaming Ganguly for his ouster. The CAC recommended Rahul Dravid (batting) and Zaheer Khan (bowling) as consultants to the team, possibly aimed at not letting Shastri call the shots. But Shastri was granted the services of the support staff he desired by the Committee of Administrators. Bharat Arun was reinstated bowling coach, a position he held during Shastri’s tenure as team director, while former batting coach Sanjay Bangar was elevated to assistant coach. 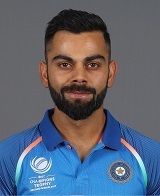 When been asked if the Indian Captain, Virat Kohli was feeling any added pressure given the events of the past few weeks, he shrugged it off. Be the first to comment on "Ravi Shasthri takes a dig at CAC led by Sourav Gangully"